Mail coach on the Bath to London run, c1840. The Mail Guard leans out from the coach to collect mail from the Postmaster (right in nightcap) without stopping. 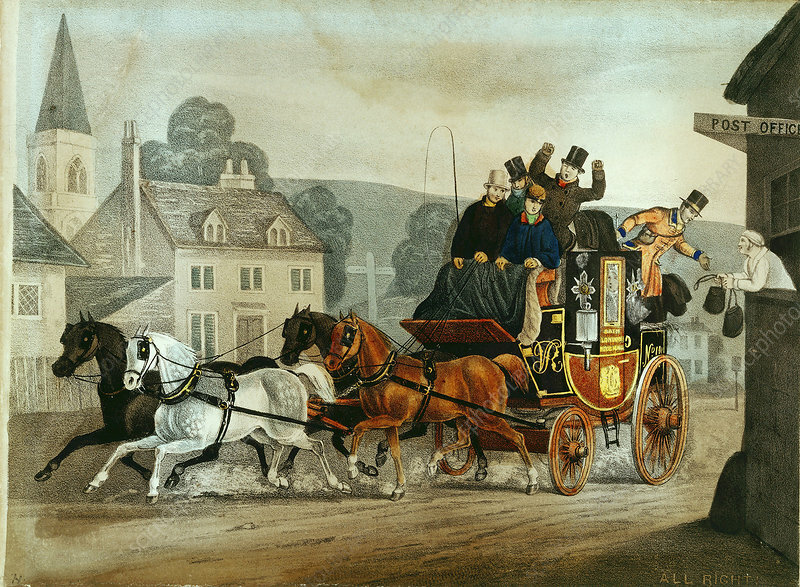 The improvement in the road network in the mid 18th century led to the introduction of the mail coach in 1784, providing a combined passenger and mail delivery service. Mail coaches bore a distinctive livery of maroon doors and lower panels, black upper panels and Post Office red wheels. The names of the towns at either end of the journey were painted on the doors. Mail was stowed both in the foreboot beneath the coachman's feet, and in the rear compartment. The coach carried four passengers inside, and four more on top behind the driver. Fares were paid to innkeepers at coaching inns along the route. As well as the driver, mail coaches carried an armed Mail Guard to protect the mail from highwaymen.